How might you overcome those challenges? Where might you find a sense of play and possibility in your creative process? It won’t surprise anyone that I love The Hero is You. This book invites you think about your writerly development within the context of the Hero’s Journey as defined by Joseph Campbell. What’s more, the ideas and concepts included are highly compatible with Writerly Play. 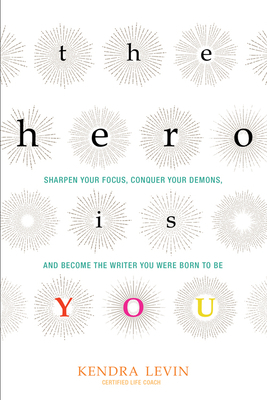 The Hero is You is subtitled: Sharpen Your Focus, Conquer Your Demons, and Become the Writer You Were Born to Be. While ambitious, this promise is realized in the book. Levin examines eight archetypes that Campbell identified as common to tales around the world for thousands of years. With each archetype, she illuminates one aspect of the writing process and life. Through the lens of these archetypes, we see aspects of our creative selves. Once seen, we can play to their strengths. Imagine having your own personal mentor―someone encouraging yet honest, supportive yet empowering, who could help you set and achieve your goals, turn your moments of doubt and fear into sources of strength, and discover what you’re truly capable of when you’re at your best. Kendra Levin is that mentor. And with this book, she’s here to help you do the best writing of your life―and live your best life while doing it. Whether you’re a first-time writer with a brand-new project or a seasoned pro, you’ll reach the end of this book feeling fulfilled, inspired, and ready to mentor the next writer on their creative journey.